Rs 14,000/- pm for office expenses, which includes Rs 3,000 for stationary items, Rs 1,000 on franking of letters and Rs 10,000 for secretariat services. A monthly constituency allowance of Rs 10,000. A daily allowance of Rs 500/- when Parliament is in session. Parliament has three sessions every year. The Budget Session (February to May), Monsoon session (July to September), and Winter session (November and December). A daily travel allowance of Rs 8/- per kilometre. Each MP and his spouse or companion are entitled to unlimited, free, first class railway travel anywhere in the country. They can travel at any time without the problem of reservation/cancellation etc. and they do have Special Quota in all trains. An MP can travel anywhere in India, with a spouse or companion, 40 times by air free of cost every year, business class. An MP will get a bungalow- type accomodation in the heart of New Delhi for which he has to pay a rent of Rs 2,000/- pm. Each MP will get free electricity of 50,000 units pa. and free water. The MP’s bungalow will be furnished with air conditioners, refrigerators and television sets free of cost. Maintenance of the house including washing of sofa covers and curtains is done free of cost by the Government of India. MPs are entitled to 3 telephone lines and 170,000 free local calls pa. When an MP travels abroad officially, he is entitled to free business class air tickets. He is also paid a daily travelling allowance, which will vary depending upon the country being visited. The Medical expenses of MP’s will be taken care of by the “Contributory Health Service Scheme” of the Union government of India. Each MP will be given Rs 2 crores pa. from the “Members of Parliament Local Area Development Fund”. The MP’s will not get this fund in cash. The fund will be transferred to respective district headquarters where various projects will be implemented for the welfare of the people of the constituency of the MP. After an MP completes a term in office, he is entitled to pension. The basic monthly pension amount is Rs 3,000/- pm, and the gross pension will be proportionate to the number of years of the service of the person as MP. On reading the above we may think that an MP can stay at the capital of India with all luxuries without any expenses out of his pocket. He can travel anywhere in India with a spouse or a companion, in trains and flights. He is getting a lot of amount as allowances. He is getting a total amount of Rs 10 crores in 5 years, if the MP continues for the normal full term. 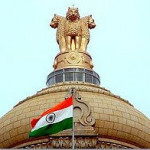 However, it must be noted that if a person opts to become a Member of Parliament in India, he will have to often travel from his native place to Newdelhi and other places. He will have to stay out of his home at Newdelhi leaving his family members and relatives. The MP has got the moral responsibility of doing the best to his constituency and utilize the funds received for the welfare of the people. The salary of he MP is comparatively less when compared to many white collared jobs. However, it must be noted that it is not that easy to get an MP seat, for competing in the election for MP; and it is still more difficult to win in the election and become an MP. The amount to be spent for becoming an MP is very large. In the party pattern of Parliament in India, there are many stages of becoming an MP. It is very difficult to contest MP election as an Independent candidate and win the seat. There are many facilities such as Telephone connection when a person contests in an election for MP. Because of the present system of Indian Parliament formation, in the diversified parties, alliances, support from outside, participation in the government etc., when there are situations where the majority of the parties could not be ascertained, the MP’s in India become commodities having a price, quoted in crores by various parties. To avoid unpleasant situations after the elections the system can be revised and if only two major parties/groups compete directly, there will be a stable Government and the MP’s need not become “Commodities” as explained above. Is India the Main Enemy of China?